Between the morning and evening commuting rush hours, there are fewer trains going into and out of Union Station. So you get a chance to see the interlacing of the tracks. This is not the building's entrance. It is a mural on the building at LaSalle and Division. 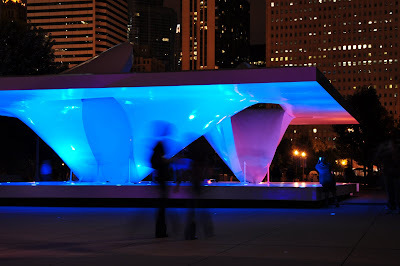 Originally done in 1980 by artist Richard Haas and restored in 2005, it is titled "Homage to the Chicago School of Architecture". It is quite the detailed mural - even including a shadow to continue the illusion that it is three dimensional. It includes portraits of Frank Lloyd Wright, Daniel Burnham, Louis Sulivan, and John Root (see detail below), architects closely associated with the Chicago School of Architecture. With a long flight still ahead, this migrating Nashville Warbler is getting some dinner and doing a little yoga stretching so he's limber enough to get down to Mexico. 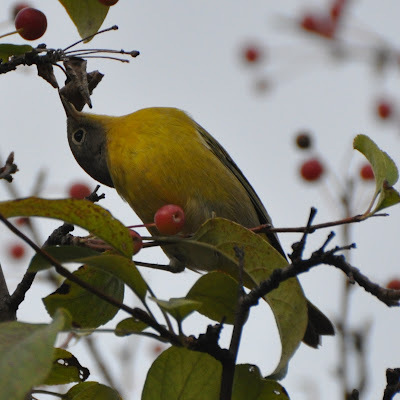 More pictures of the Nashville Warbler are at my bird-watching blog, which is here. 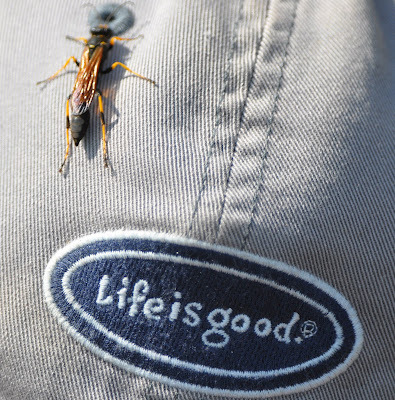 I guess life is good if you are a bug and you land on someone's hat and you get your picture taken instead of getting swatted. 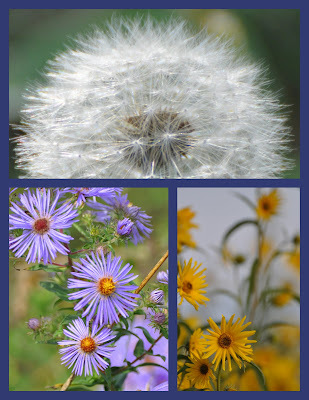 Bugs, like wildflowers, are not my area of expertise. No clue what this is -- only that I think it is an interesting looking insect. 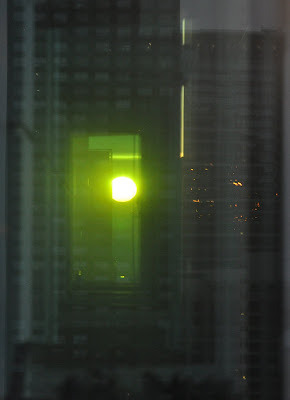 I happened to be home just before sunset yesterday and saw this green light in the window. I looked and realized it was the sun. Now, I've heard about the phenomena of a Green Flash at sunset, but I really thought it was at sunset - not as the sun was setting. I had never seen the green sun before and can only guess that people at the other end of the hall usually have their blinds closed. So here is the first sunset of Autumn, tinted naturally. Well, not naturally, exactly - it is after all through several tinted windows -but, at least without software intervention. 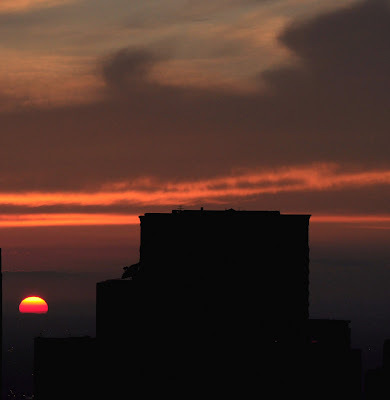 Here is the sunset without the window filters. A certain organic-focused grocery store built a brand new store in the Lincoln Park neighborhood of Chicago. It opened over the summer but I hadn't visited it yet. It is so large, they give you a little map as a guide to finding your way. There's a food court and a sushi bar as well. I got so distracted looking at all the different mini-restaurants that I forgot to buy the olive oil that I went to get. ... before getting their beautiful red, adult colors. 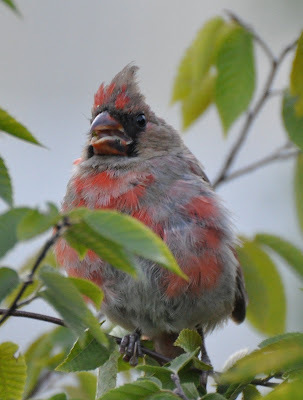 A few more pictures of the Cardinal's "transitional"phases are at my bird blog, here. Never really looked at barbed wire all that closely. It has a rather interesting - and I'm sure painful - pattern, especially against a blurry leafy background. 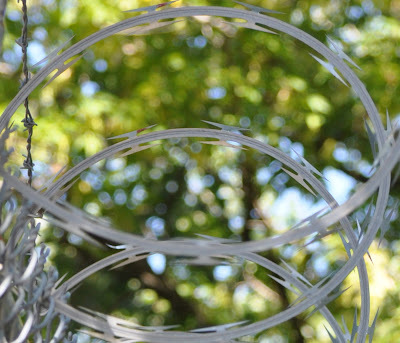 This particular barbed wire surrounds a Marine Reserve Headquarters in the Albany Park neighborhood. We were exploring a section of the Chicago River in search of birds. Saw a lot of finches, some herons, and a very camera-shy Belted Kingfisher. Also saw a number of very brave kayakers. They are brave because the river is not too clean in this section. I was going to call this post "Tunnel of Trees", but this stretch of trees doesn't come close to rivaling a beautiful stretch of road in Northern Michigan known by that name. And it did kind of look like the trees continued in these straight rows out to infinity. The shadow patterns on the ground also caught my attention. There's a puppet bike at the corner of Randolph and Michigan. It's there most days but I finally saw the puppet show. Two little fuzzy animals (a squirrel and a bunny?) gyrate wildly as music plays. 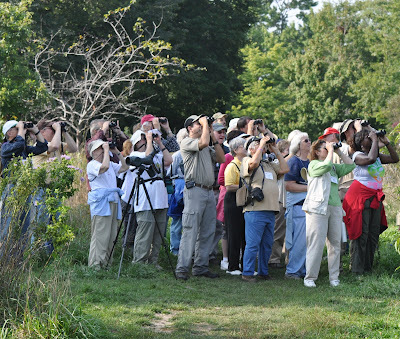 It seems the Fall Bird Migration has begun to get active in the Chicago area. I was at the Magic Hedge (by Montrose Beach) and happened to turn around to see this sight. Not wanting to miss anything, I walked back and looked in the general direction as everyone else. 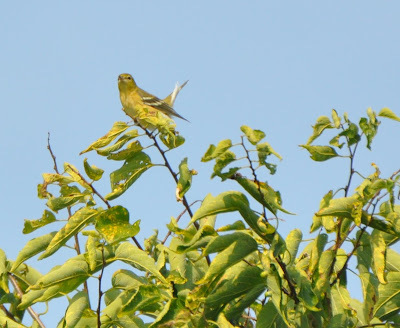 There were a lot of warblers flitting about in a tree. Sitting at the very top (a rather dangerous location given that two Cooper's Hawks were in the area looking for a snack) was the immature bay breasted warbler, shown below. 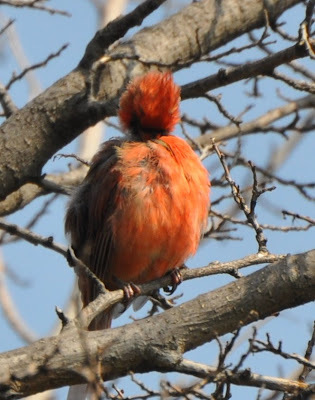 It doesn't have its full adult colors, like it will in the spring. 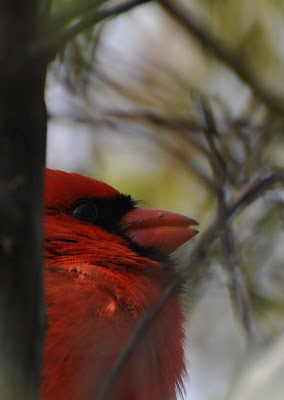 In fact, most of the birds going through now won't look like they did in the Spring. That's what makes it challenging. 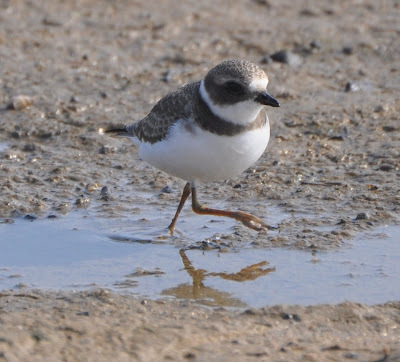 This little Semipalmated Plover was so happy to be spending last weekend at Montrose Beach that it broke out into a high-kicking chorus line routine. A few more shorebirds were at Montrose this past weekend (they declined to join in the chorus line, though). Pictures of them are at my bird-watching blog, which is here. 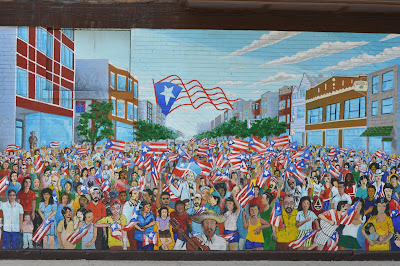 This is a mural in the Humboldt Park neighborhood of Chicago. 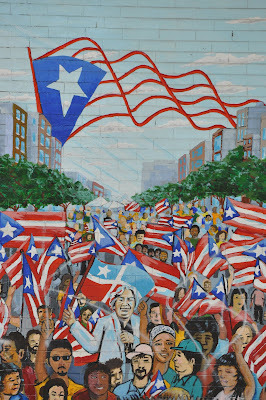 According to the sign, it was designed and painted by Gamaliel Ramirez (with assistance from community residents) as part of the the 11th Fiesta Boricua in 2004. This is one of several beautifully colorful murals I've stumbled upon in the Humboldt Park neighborhood. 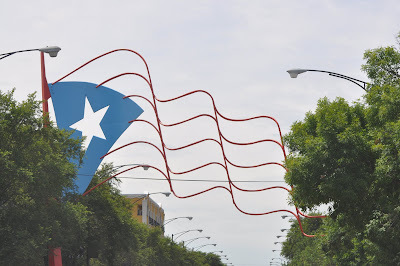 The large sculpture of the Puerto Rico Flag, shown in the mural, actually exists (see below) and arcs over Division Street. The numbers are updated at the end of the baseball season so these figures are as of the end of the 2008 season. The first two digits (00) are the number of years since the Cubs won their division. So "00" means they won last year. So far so good. The next two digits (63) are the number of years since the Cubs won the National League. So "63" means they last won the National League in 1945. The last three digits (and, yes, they had to ADD a digit last year), represent the number of years since the Cubs won the World Series. Gee, has it really been 100 years? Somewhere, Steve Goodman is still watching and singing The Dying Cubs' Fan's Last Request. It was a Crosstown Classic (Cubs vs. White Sox) make-up game from an earlier rain-out. 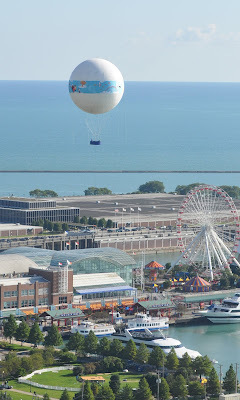 It was a beautiful day but, as a Cubs fan, not such a beautiful outcome (Cubs got trounced). But Cubs fans are kind of a special breed (hey, we're still fans and they haven't won in 100 years). This is the shirt that the guy in front of me was wearing. 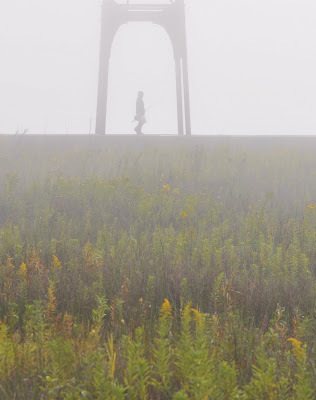 We've been having a lot of foggy lakefront mornings lately. This fisherman is heading home in the morning fog along the pier at Montrose Harbor. 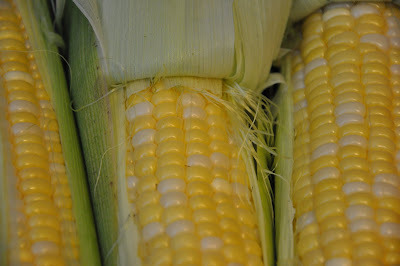 Leave it those Nichols guys to get all artistic with the way they stack the sweet corn at the Green City Market. One of the guys said that it was supposed to entice people over to their stand. When I told him that I felt guilty buying the corn since it ruined up the design, he said he was going to go mess up the stack. I certainly didn't feel guilty buying the corn after getting it home and seeing the beautiful gold and white kernals (this is bi-color corn). And it's very sweet!